Today, I stood up against something I believe to be wrong. I took action in the way I never have before. Slipping standard are a problem that need to be addressed, and if I must be the one to do it then I take on that responsibility happily. Today I complained to a snack company. As any British readers will know, Walkers is Britain's largest manufacturer of crisps and other salty snack goods. Earlier I purchased one of their products, Wotsits. Purchasing your Wotsits today, I was left disappointed. I buy your product because of the cheesy high quality not offered by other, cheaper brands. This offering was lackluster, not of the quality I have come to expect from Walkers, delivering barely any flavour at all. Is this some mistake, or is it a permanent measure, to save money. If the latter I will instead give my money to those other brands as the taste now differs little. Now I understand why the elderly do it. I have felt the thrill of the petty complaint and it is intoxicating. I really hope I get sent some free Wotsits. P.S, the gif at the top (which accurately depicts my emotion after sending the email.) 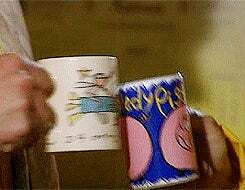 is from Spaced, which of all my nerdy loves seems to get the least appreciation in gif form here and across the rest of the internet. I aim to rectify this. All of this is to say: Hi! I'm Goron-roll! You can expect this, and things entirely unlike this in the months and years to follow. What would Spielberg, Cameron or Scott do with $25 mil?